A Managed Registration is a trip registration that is managed by another user (aka a Parent user). The Parent User will be in charge of exactly that - managing all aspects of the "managed user" like uploading requirements and finalizing payments. With the managed registration, each trip member's ticket is combined together to create one fundraiser. This type of registration is best used for parents managing a minors registration. To find your managed trip registrations, login to the Pure Charity account of the parent user. Then look under the Events Tab, then the Event Name. You will see each individuals Requirements there, as well as the joint fundraiser. 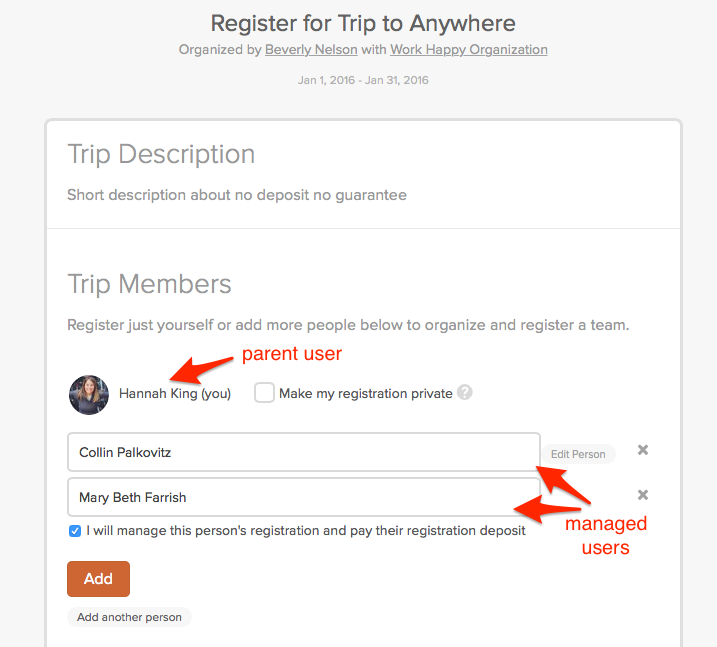 Remember when signing up, the Parent user is ALSO registering for the trip, along the with managed users. If you are the Parent user and not attending the trip, please register for the trip under one of the trip members attending. Then you can simply manage your child's account. Once the registration is completed, a child registration cannot be added to the registration. They will need to be signed up separately using another email if needing to register. Fundraisers cannot be split out one the parent/child fundraisers are created. The individuals will need to fundraiser together unless given permission to create another fundraiser from the Field Partner. How do I add an Admin to my Nonprofit Account?